Alfalfa is known as the “the king of pasture”. It can grow up to 1-3 feet high. Alfalfa grows quickly and adapts to various environment. Generally, it can be reaped for 4 times a year, and 12 times in some areas. Alfalfa is common in lawns, parks and fields. Alfalfa has high yield and nutrient content, suitable for various livestock and poultry. For a long time, alfalfa has been an excellent animal feed. Alfalfa has higher protein content and less fiber content than other grasses. 1 ton of alfalfa contains the same quantity of protein as 2/3 tons of soybean. And the quality of protein is high, and 70% of it can be fully digested by animals. 1 ton of Alfalfa contains the same quantity of TDN (total digestible nutrients) as 1 bushel of corn. Animals fed with alfalfa tend to grow faster and stronger, with more meat, milk and eggs output. Alfalfa can provide minerals and vitamins for animals. 1 pound of alfalfa can meet the nutrition demand of animal who weighs 100 pounds. And the vitamin A in alfalfa helps the growth of beef animals. Making alfalfa into pellets can reduce its volume, so they are convenient to store and transport. Alfalfa pellets are more palatable for animals than bulky alfalfa. Making pellets can reduce food waste and promote feed intake. Alfalfa pellets are easier for digestion and nutrition absorption. Cows fed with alfalfa pellets have their milk yield increased. Pigs eating alfalfa pellets have less possibility to get constipation. Alfalfa pellets can provide more nutritional value than the same quantity of alfalfa, as a recent research indicates. So making pellets can save your fodder. Alfalfa pellets can provide livestock with forage-based calories, which doesn’t have the side effects that high sugar and starch feed cause. Alfalfa pellets can also play the role of fuel. It is recommended to mix alfalfa with other biomass materials such as sawdust, grass, waste papers to improve the burning efficiency, and reduce the ahs and smoke emission. Alfalfa is a nitrogen-fixing plant. It deposits nitrogen from the atmosphere. The nitrogen content is about 5%. It also has other plant growth promoters like minerals and triacontanol. You can make alfalfa into pellets and spread them in farmland as fertilizer. They apply to flower, vegetables and other plants, and stimulate their growth. As alfalfa pellets have higher density, they can nurture the plants for a longer period. How to make alfalfa pellet? The alfalfa for making pellets should have the moisture content of about 15%. For production lower than 500kg/h, natural drying by the sun is enough. For large-scale production, you can use a rotary dryer in the alfalfa pellet production line. Only materials of certain sizes can be feed into the pellet making machine. You can use a hammer mill or a grinder to process alfalfa materials into small sizes, usually Φ3-5mm. You can feed the ground alfalfa into a pellet machine. It can mold your materials into solid and cylindrical pellets. 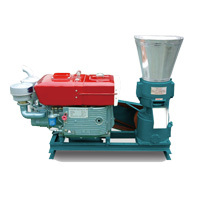 Choose a suitable pellet machine according to your production scale and power supply. You can consult us for advice! The newly produced pellets have high temperature of 85 ℃. They need to be cooled for packing and storage. You can use a counter flow cooler or a horizontal cooler. For small-scale production or home use, you can put alfalfa pellets on ground for natural cooling. So the cooler machine is optional. To facilitate storage and transportation, you can pack pellets into bags. The pellet packer can automatically put pellets into bags of different sizes. Alfalfa pellet machine is used to process alfalfa materials into pellets. They can be classified into 2 types. Ring die pellet machine is suitable for large-scale production, while flat die pellet machine is fit for small-scale production. Besides, they have electricity, gasoline, diesel and PTO 4 driving types. You can choose the right one according to your production requirement and power resources. Flat die and roller are the wearing parts in pellet machine. Superior material and high hardness can ensure their working life. The hole size of flat die is from 2mm to 10mm. To make fine feed for chicken and fish you should use smaller size. To make coarse feed for sheep and horse you should use larger size. To choose high-quality alfalfa pellet machine, a reliable supplier is the most important. It should have certifications and warranty policy, and provide comprehensive service. 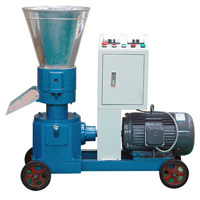 TICO is an experienced pellet machine manufacturer and suppliers. We are specialized in small pellet making machine for home and farm use. We also provide auxiliary equipment like dryer, cooler and hammer mill. welcom to send enquiry in the chart below!